of Tunnel Creek from your Bunuba Guide. 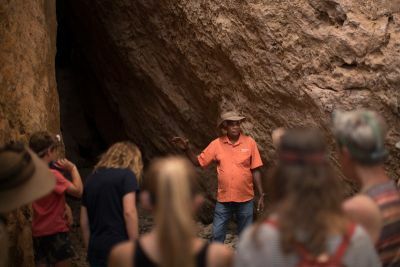 Join your Bunuba guide on a walking tour deep beneath the limestone of the Napier Range and discover the secrets of Tunnel Creek and its spiritual significance to the Bunuba people. Tunnel Creek is a water worn tunnel beneath the limestone of the Napier Range. Part of a 350 million-year-old fossilised Devonian Reef system. The creek is about 750m long and is one of the oldest known cave systems in Western Australia. Explore the creek, see rock art and relive the life of Jandamarra, a moving story of a man between two cultures. The powerful story of Jandamarra is central to an understanding of the Bunuba people, their intense spiritual connection to the land, and the tragic history of the early days of European colonisation. Dillon Andrews grew up hearing the stories and feels the presence of Jandamarra whenever he walks in his country. When you join Dillon on one of his tours, you will feel the presence and the power of Jandamarra too.